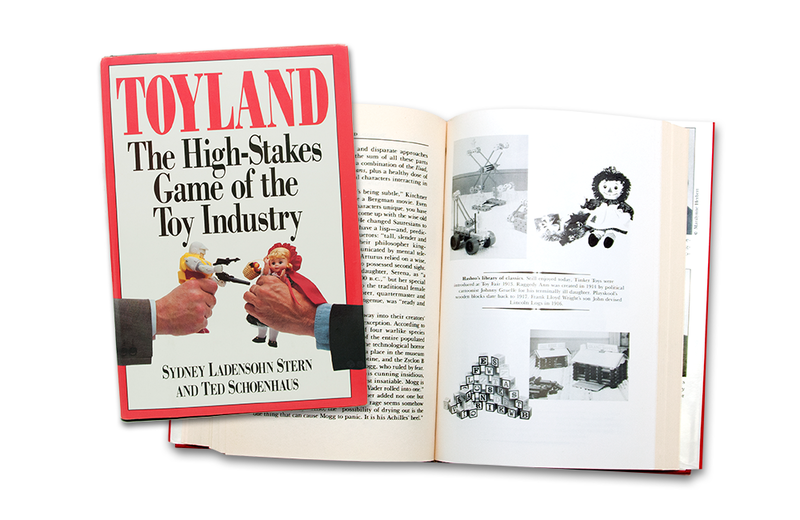 Published in 1990, Toyland: The High-Stakes Game of the Toy Industry, is an engaging snapshot of the toy business as it was in the mid-1980s. A major focal point of the book is the roughly two-year development process of the Dino-Riders, the first foray into the ultra-competitive action figure market by Tyco Toys. Co-authors Sydney Ladensohn Stern and Ted Schoenhaus profile the creative team behind the initial concept and trace the trials, tribulations, and trade-offs that led to the Dino-Riders official launch on December 26, 1987. The narrative is driven by the Dino-Riders’ development process. The authors use various product-development milestones as springboards for discussion of history, advertising strategies, politics, and the sobering economic reality of seasonal sales cycles in the toy industry. Chapters are dedicated to the New York Toy Fair and key industry players at the time, including Hasbro, Mattel, and Kenner. Along the way, details of mergers and acquisitions are provided, along with some spectacular tumbles into bankruptcy (hello, Worlds of Wonder). Anyone interested in the “gold rush atmosphere” of the nascent video game industry will find the chapter entitled, “Toyland Cashes In Its Chips”, to be extremely entertaining. The book is well written and the research is top-notch. Toy collectors or anyone with just a passing interest in toy manufacturing should add this book to their reading list. The Sell My Comic Books YouTube channel provides video content created to educate viewers about buying, selling, and collecting comic books. Retro video-game enthusiasts, you’re not alone! Head over to Retro Gamer to find your comrades.